Looking for some fun in Philly this weekend. Start off your weekend by going to Space 1026.Space 1026 will be holding its annual art auction on FRIDAY December 15th concurrently with the opening of the "Flipbook Festival" - a touring show of flipbooks from around the world. The doors will open at 6:30pm at which time participants can bid on work laid out around the gallery in a silent auction and get a sneak peak at the work which will be sold in the more competitive vocal auction, which begins at 9:00pm. The auction, which helps insure that the collectively run gallery/studio space will exist another year, will feature donated artwork from members and a wide range of friends. Past donations have come from art-stars such as: Barry McGee, Shepard Fairey, Steve "ESPO" Powers, Paper Rad, Brian Chippendale, Clare Rojas, Judith Schaector, and many others. You will also find many locals donating goods and services such as free video rentals, massages, websites, recording studio time, and much more. 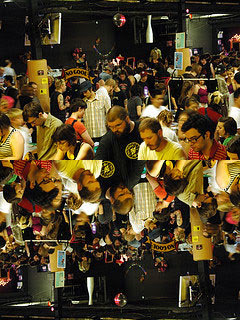 Over 2400 visitors and 120 tables of old records, clothes, art, music, food, junk, bicycles, stereo equipment, instruments, automobiles, tools, posters, furniture, computers, skateboards and lots of other stuff this pass june. All proceeds raised will goto the purchase of necessary equipment and supplies to ensure that all ages shows continue to remain a reality at The First Unitarian Church in Philadelphia. Fun things to do without breaking the bank. The people watching alone is enough to get your but off the couch and heading out the door.